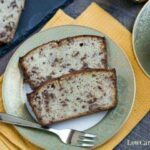 A delicious low carb banana bread that uses real fruit in a moderate amount to keep carbs low. Each slice only has about 8 grams of net carbs. 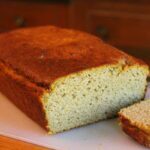 Since developing the basic quick bread recipe, I have been enjoying all kinds of variations. However, I have not yet made a banana nut quick bread. Although bananas are something many low carbers shy away from, I felt a true banana bread needed this ingredient. 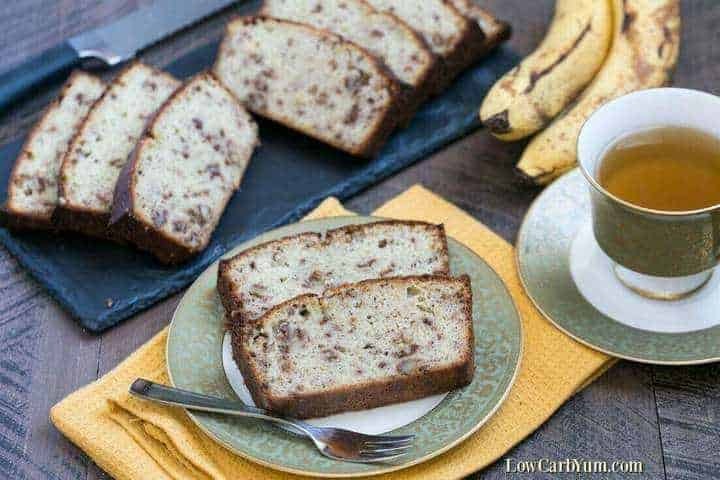 A medium banana has about 29g carbs so adding one of these to the basic quick bread recipe only adds less than 2g carbs per slice. The added carbs are definitely worth it when it comes to taste. I have tried using banana extract in place of the real fruit, but it just isn’t the same. I always have trouble when it comes to baking banana bread. It seems the time needed to fully bake the batter is so long that the outside tends to burn before its done. Therefore, I turned down the oven temperature a little and baked this bread a bit longer. Don’t be surprised if you need more time in the oven. 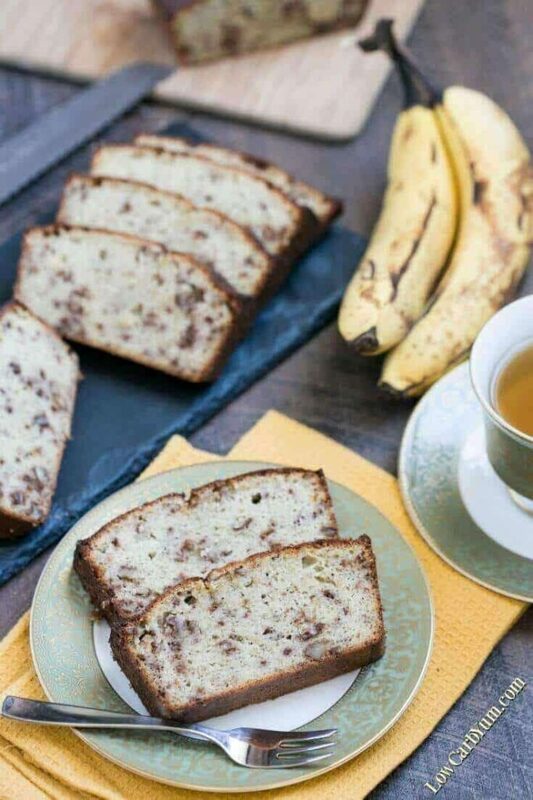 Just keep the low carb banana bread in until it passes the toothpick test and no longer has any soft areas. Another option is to divide the batter into muffin or donut molds so the baking time won’t have to be so long. 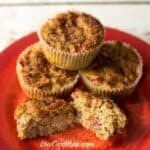 Baking the quick bread in mini muffin tins would also be a terrific way to watch portion. Just one little muffin is enough for a quick snack. I’ve also made banana nut muffin donuts which bake up quicker. You can find that recipe here. My banana nut muffin donut recipe uses a mix of almond and oat fiber. However, I thought the donuts were a bit large. Mini size would be better. 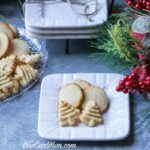 This is a wonderful treat to make for your friends who are still on a high carb diet. 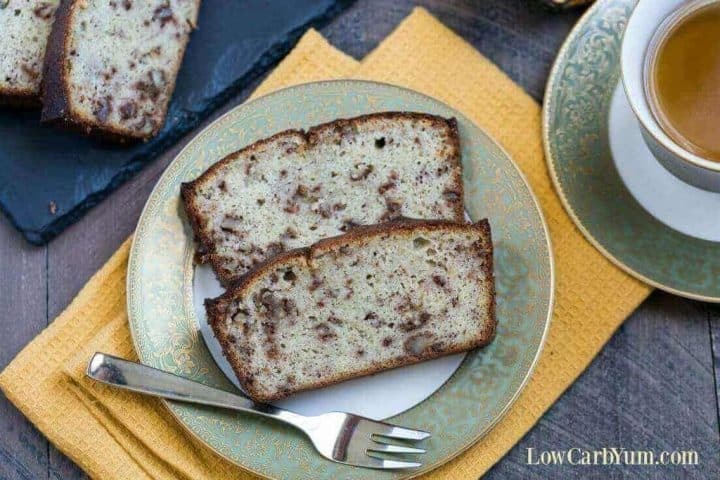 They’ll never know it’s a low carb banana bread. 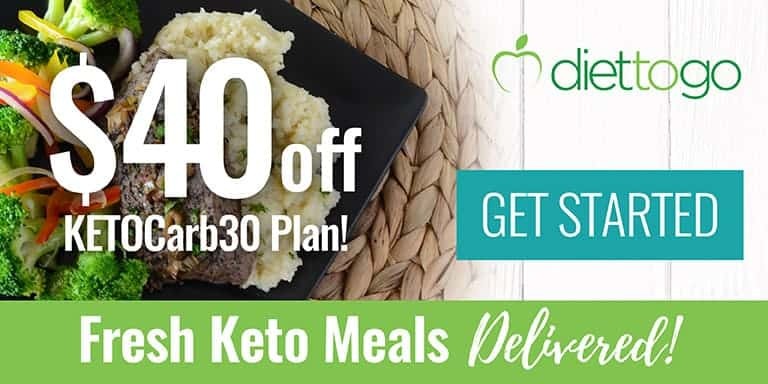 Maybe you can win them over to eating better when they realize how delicious the food is! 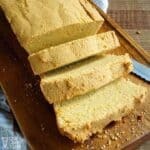 If you enjoy this low carb quick bread recipe, you may enjoy some of the other. 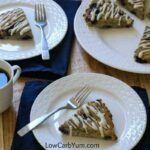 I recommend giving the Key Lime Coconut or Cinnamon Swirl low carb bread recipes a try! 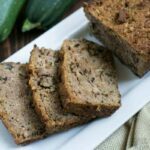 I ended up serving this low carb banana bread to family and friends. They couldn’t believe it was low in carbs. 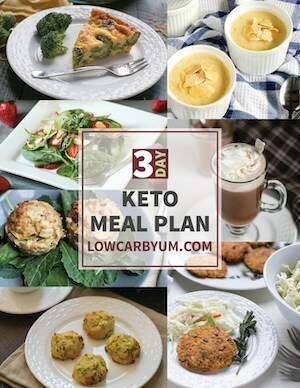 You could lower the carb count even more if you omit the banana and add in an extract. But, it just seems wrong to me to do that. If you’re allergic to nuts or dislike them, simply leave them out. I think they make it a heartier bread. And, they provide some extra protein and nutrients. I’d like to thank Slate Plate for the beautiful slate serving tray featured in the photo. If you’d like one for yourself, check them out at SlatePlate.com. 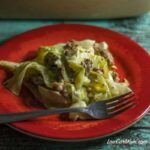 Do you prefer low carb banana recipes that use extract flavoring or real fruit? I think some recipes, like bread, really need the fruit for the best taste and texture. 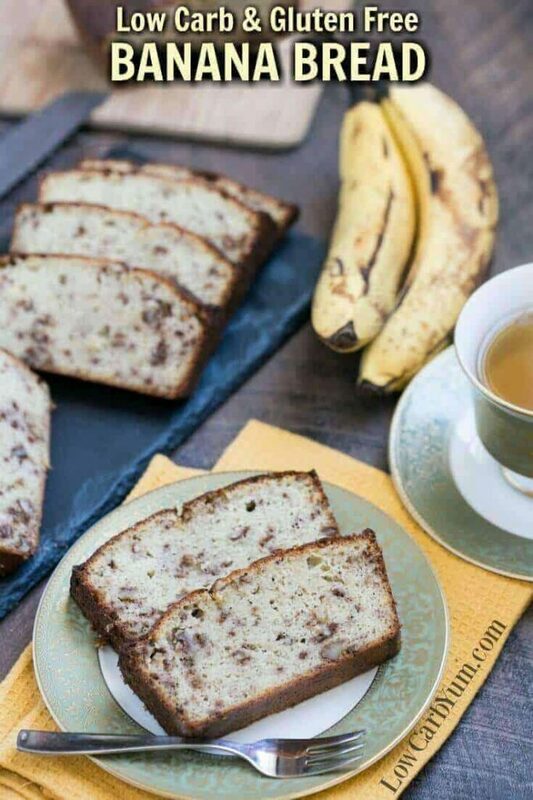 A delicious banana quick bread that uses real fruit in a moderate amount to keep carbs low. Each slice only has about 8 grams of net carbs. In medium bowl, mix together dry ingredients (almond flour, coconut flour, xanthan gum, salt, stevia, erythritol, and baking powder). 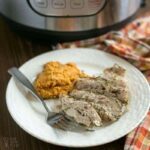 Add mashed banana, butter, coconut oil, eggs, and vanilla extract into a food processor. 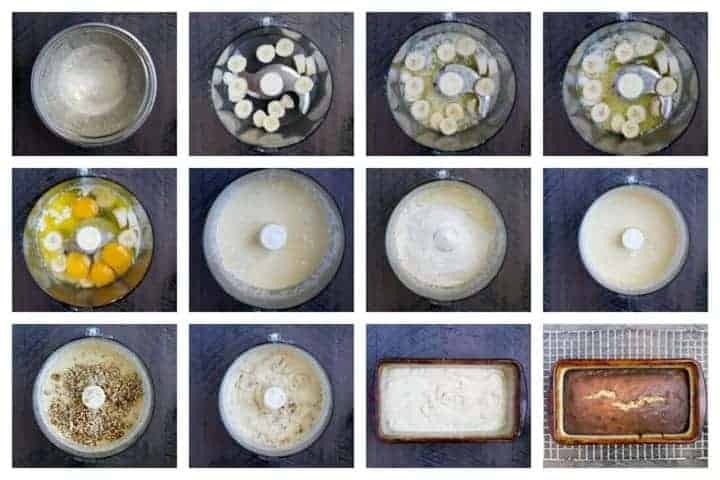 Process until well blended. Add dry ingredients and process until uniform batter is formed. 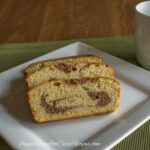 Pour batter into a greased 9×5 inch loaf pan. Bake at 325F for 70-75 minutes or until top is browned and toothpick inserted comes out dry. Less eggs should work. May be able to use only 4 or 5 eggs.